Lynnette Joselly: The Perfect New Years Dress. The Perfect New Years Dress. Have you found the outfit you will be bringing in the new year in?? If not, you should def think about getting either a one shoulder, mesh or sequined dress. As long as it is a simple yet elegant dress that would be perfect for the occasion. Who doesn't want to look fabulous during the traditional midnight kiss? Check out some of the items I thought would be a good pick for the ladies to wear at the countdown. 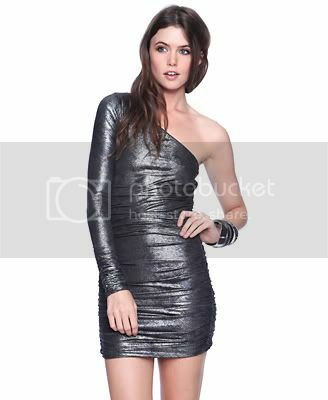 This traffic stopping lamé dress features a one shoulder construction and a ruched fit to accentuate your curves. Hit the club in this sleeveless knit dress. It has a scoop neck, exposed zipper closure in back, and decorative seams along the skirt. It features a mesh upper that creates the appearance of a sweetheart neckline. Stripes of sequins fancy up this sleeveless woven dress featuring a scoop neckline and key-hole back with loop and button closure. Hope this helped! Have a Happy New Year!